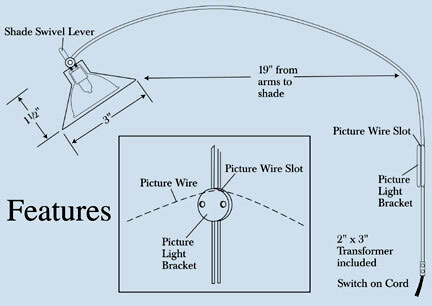 Shade swivels easily for optimum positioning. Lightweight metal arm arches 19 inches from artwork. LED lighting emits very low heat and is very energy efficient. MR16 LED bulb lasts 30,000 hours. This lamp is not dimmable. 2"x3" transformer plug does not fit into recessed outlets.